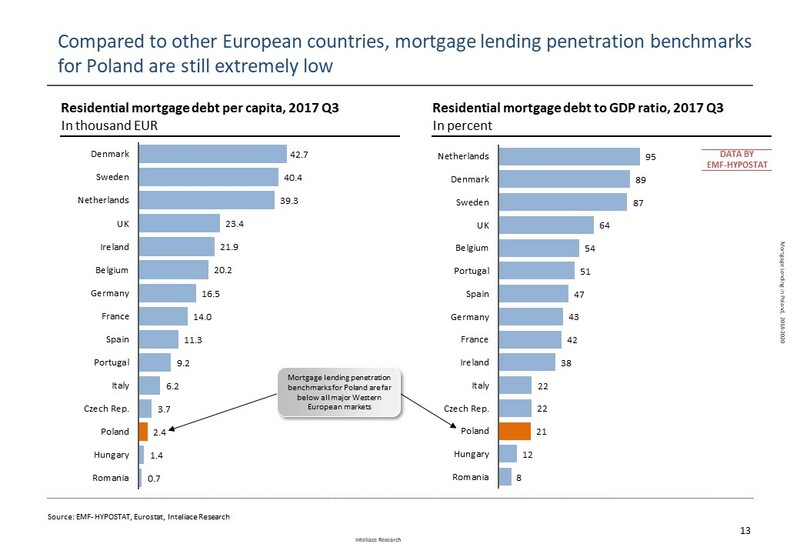 Research Report: "Mortgage lending in Poland, 2018-2020"
Residential construction in Poland accelerated again in 2017 extending growth trends observed since 2014. While the number of completions jumped by 9%, the number of new permits surged by nearly 18% in 2017 alone. The key driving forces of new residential construction remained unchanged. Stable, record-low interest rates and rising purchasing power of individuals fuel new purchases. Moreover, real estate investments have been increasingly popular in view of growing residential rents and due to low opportunity cost of holding cash or deposits. After multiple years of stagnation mortgage lending has seen some recovery during 2017. Sales of new mortgage loans increased by 5% and 11% in terms of volume and value respectively, which also reflected growing average loan ticket size. Looking forward, in our base scenario, we expect new mortgage lending to keep growing at moderate rates through 2020. The total outstanding is likely to increase by 5% p.a. Slide 18: CHF/PLN exchange rate, 2005-2017, CHF-denominated loans outstanding.